The proven way to aerate your lawn, flower beds, and garden the quick and easy way. No more ugly plugs! Turf2Max is more cost-effective than lawn core aerators – plug aerators and leaves no mess. Why spend all day producing ugly plugs when you can apply Turf2Max in one hour or less. Turf2Max soil aerator is a liquid, organic blend of environmentally friendly components that loosens and aerates compacted soils, even in high traffic areas, or where plant growth is difficult to maintain. This unique product is not simply a wetting agent (surfactant) that simply alters the surface tension of water in order to penetrate into the soil deeper. Wetting agents will not loosen or aerate soils or promote the formation of water stable aggregates. Don’t confuse it with products that contain surfactants, wetting agents, or penetrants. 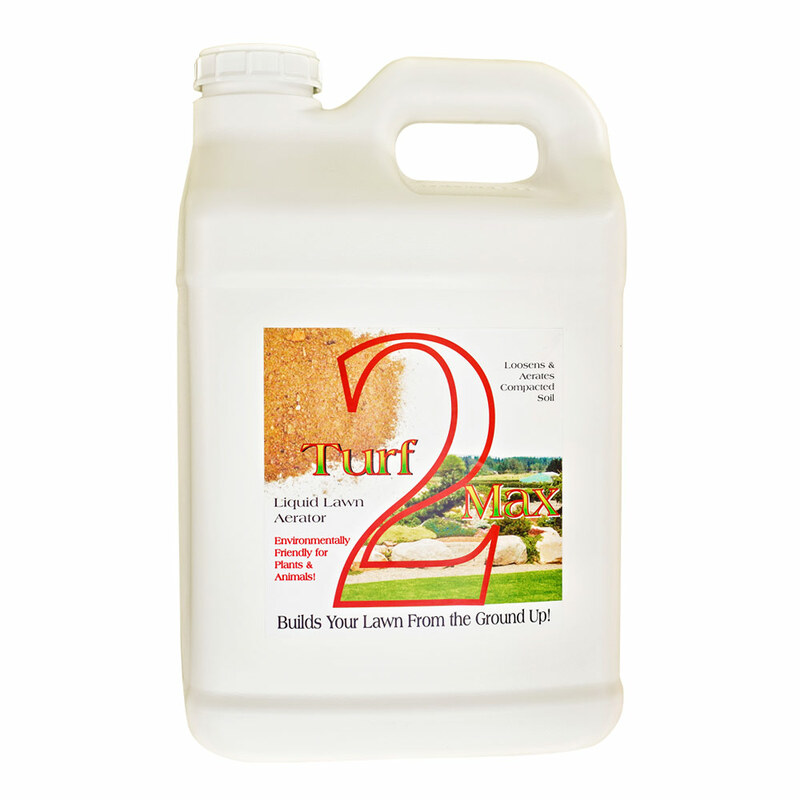 Turf2Max is scientifically designed to do much more and last much longer than those other products. Turf2Max soil aerator is a non-toxic and non-bioaccumulative (does not uptake into plants) soil amendment that is environmentally friendly. What are the Benefits of Turf2Max? Lawn aeration is one of the keys to healthy grass growth. It allows essential water, air and nutrients to infiltrate deep into the root zone wherever they are needed. The deeper vigorous root systems created results in thicker, greener grass. The enhanced functioning of the soils natural organic processes means that there is a reduced need for fertilization. The best thing about Turf2Max is you spray it on your whole lawn, garden or sports field. And then it works, and keeps working, and keeps working. When you use a machine, you’re pulling out plugs here and there and that’s it. End of story. Sure, mechanical aeration is good for turf. However, Turf2Max is better, easier, and more economical!